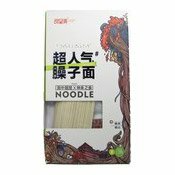 Ingredients: Noodles: Wheat Flour (65%), Water, Salt. Seasoning: Rapeseed Oil (60%), Dried Beancurd (30%) (Soybean, Water), Salt, Chinese Prickly Ash, Mushroom (1%), Sesame. Vegetable Pack: Carrots, Shallots, Black Fungus.